So let’s wrap up the Round of 16 before we move on to tomorrow’s first set of quaterfinals! Day 3 began with a rejuvenated and unified France vs African nations champions Nigeria, in Brasilia. From the start an impressive Nigerian outfit took the game to France and was, as we like to say home ‘balling’ them! For much of the first half it was all Nigeria as Jon Obi Mikel & Ogenyi Onazi ran the French midfield ragged. They even had a first-half goal by Emmanuel Emenike disallowed, though replays showed this was harsh. 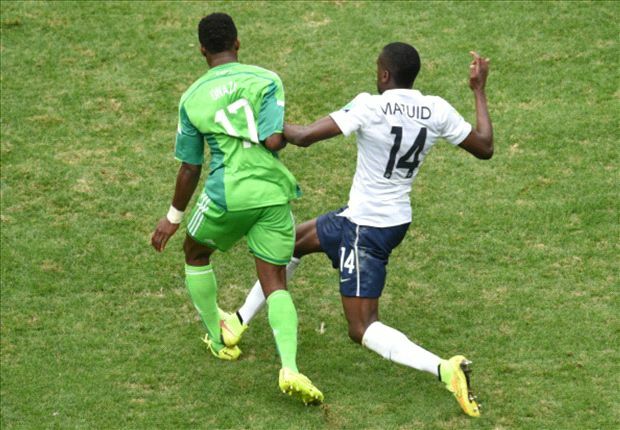 The match turned on a savage horror tackle by France’s Blaise Matuidi on Onazi just at the start of the 2nd half, that ended up with the Nigerian being substituted (and eventually leaving the stadium in a cast with a fractured ankle). How Matuidi was not red-carded only the ref can say! Once Onazi went off Nigeria lost control of the match, and a key substitute by Deschamps eight minutes later, bringing on Anthony Griezmann for an ineffective Oliver Giroud, swung the game emphatically in France’s direction as Karim Benzema returned to his favored forward role. Les Blues swarmed the Nigerian goal for the rest of the game in what became the Paul Pogba show. Monsieur Pogba warmed up with a rasping volley that the impressive Victor Enyeama did well to save. Eventually the pressure told, and in the 78th min Enyeama, who had kept France out for much of the game, parried a corner right onto Pogba’s waiting forehead and France were 1 nil up. Despite gamely searching for an equaliser, 12 minutes later Joseph Yobo put through his own net and Nigeria were out. The scoreline flattered France, but the results is all that matters: France 2 – Nigeria 0. Allez les Bleus! The Day ended with one of the favourites in Germany taking on plucky Algeria in what many thought would be a routine win for the Germans in Porto Alegre. It couldn’t have been further from the truth! Someone had obviously forgotten to send the script to the Algerians who went toe to toe with Loew’s men. For 90 minutes Algeria showed they were not impressed , and were actually the only team to put the ball in the net, though it was correctly ruled out for what was a marginal offside. The sterility of the Germans had much to do with the imperious form of the Algerian goalkeeper Rais M’Bolhi who executed some spectacular saves, including denying one point blank header from Thomas Mueller in the 2nd half. The Algerians showed they weren’t here asa sidepiece and at the other end Manuel Neuer was equally impressive in his role as goalie and sweeper, protecting his defence more times than they protected him, especially first half. The match went into extra-time and finally the Germans broke through with an exquisite backheel by substitute Andre Schurrle in the 92nd minute. With the Algerians desperate to at least take it to penalties the Germans scored a 2nd through Melmut Ozil in the last minute of extra-time. Algeria however had the last word, scoring a minute after through Abdelmoumene Djaboud, giving the Germans one final scare before they exited with their pride intact: Germany 2: Algeria 1 AET. Los geht’s Deutschland! Day 4 began with Argentina vs Switzerland in Sao Paolo. Here we had what appeared to be a clash of styles. Argentina vs Switzerland… Attack vs Defence… who would win? From the first few minutes it was clear that the Swiss plan was to deny Lionel Messi any space to do damage as Gorlan Inler and company flooded the middle and attacked on the counter through the pacey Xherdan Shaqiri. It was a plan that worked for the most part – Messi and his accomplices probed and prodded but found no clear openings, and the match was a constant back & forth with many half-chances but no breakthrough. After 90 minutes there was no winner and we had yet another period of extra-time. That eventually came when Messi, finally given room in the 118 minute with penalties looming, engineered a swift counter setting up a clinical finish from Angel di Maria in the box – the dynamic duo had delivered again and the Swiss vaults had been breached: Argentina 1 – Switzerland 0 (AET). Vamos, vamos Argentina! The final match of the round saw dark horses Belgium against the good ol’ USA in what turned out to be a pre-4th of July cracker! I’ll be honest and say that Belgium up tot his point had been largely underwhelming but boy did they turn up that day! For much of the game the US were hanging on for dear life as Belgique stormed their 18 yard box and if it wasn’t for a man of the match performance by goalie Tim Howard, who set a record for the most saves in one world cup game at 15, the scoreline would have been embarrassing! Still the Americans weathered the storm and even took the game to the Belgians in the 2nd half, nearly winning it at the death with a spectacular miss by substitute Wondolowski in the 90th minute from less than 3 yards out! Eventually the game went into what was the fifth extra-time period of the round, and then the Europeans took over. Coach Marc Wilmots brought on Romelu Lukaku for the impressive but raw Divock Origi and it paid instant dividends. A powerful run by the Belgian forward set up Kevin De Bruyne to open the scoring past Howard in the 93rd minute. A little over ten minutes later and Lukaku had his own goal, with another trademark run into the American box, finishing coolly past his Everton FC teammate in goal. The Americans responded immediately with the young substitute Julian Green scoring a sumptuous volley past Thiabut Courtois but it was too little too late. They had fought long and hard, but Jurgen Klinsmann’s men were defeated by the better team. Belgium 2 – USA 1 (AET). Allez les Diables Rouges! !